When we got off the boat in Mazatlan we weren’t really sure where to go first. We knew we wanted breakfast, but did we want to stay in Mazatlan or head straight out of town? A man at the ferry terminal directed us to the Centro where there was a big cathedral. He said we’d find lots of restaurants there. It was crowded and noisy in the Centro, but we eventually found a little hole in the wall diner. For about five minutes we decided we’d find a hotel so we could check out the city before moving on. But by the time we had finished breakfast, we changed our minds and decided we’d rather just start moving. We stopped by the cathedral before leaving town for a quick photo. And also so Neon could leave some of his father’s ashes near the cathedral, in the city where his parents met. Our first destination was to find the boat ramp to Isla de Piedra so we could take a panga across the water to begin our ride to Villa Union, on small roads instead of the highway. Things were immediately mellower when we got on the panga and left Mazatlan. We found a dirt road heading south-ish from Isla de Piedra and improvised along the way as we crossed more roads. We found an even smaller dirt road that wound its way through the landscape, passing through several small towns before we eventually joined Mex-15, a few kilometers before Villa Union. Fruit and vegetable store in Villa Union. This area around the big church had several markets full of fresh produce. 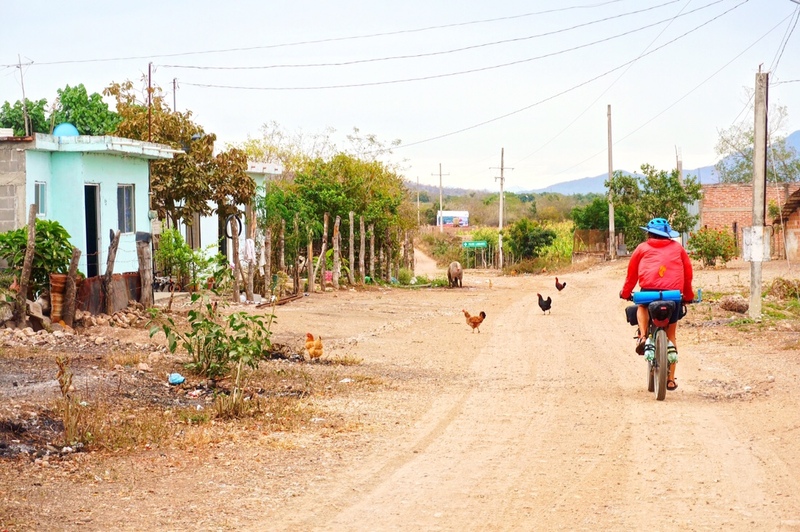 We followed a small paved road for ~15 kilometers until it turned to dirt in the tiny town of La Amapa. The town was very small, but had a school and a small tienda. After passing by several farms and ranches we turned onto a small dirt road that paralleled the train tracks. The road was in good condition and was a beautiful ride. Morro Calabash. These are not grapefruit-sized wasp galls, like I thought when I first saw them. Apparently it’s a type of cauliflory, which refers to plants that flower and fruit from their main stems and trunks, as opposed to from the ends of the stems. Morro Calabash grows all through Central America as well, and the fruit is used to make horchata in El Salvador, unlike the rice based horchata in Mexico. White tubular morning glory-like flowers were in bloom on several large trees. We stopped for lunch by this tree. While we we’re eating, we saw a man approaching through a neighboring field. He was pushing a bicycle through the thick vegetation. I turned to Neon and said, “looks like we’re on the right road.” We greeted him when he got closer. He said he was harvesting something in the field. I wish I would have asked if I could take his photo with his bike, because he had his machete wedged between his frame and dropout bars, like a holster. But it didn’t occur to me to take a photo until he was already gone. We see A LOT of people on bicycles. The bikes are usually very old, rusty, welded from various parts, and rigged in a million practical ways, with milk crates, cargo racks, or buckets for panniers. They’re pretty cool, but this was the first one I’ve seen holstering a machete. Shortly after the Agave fields we passed through the town of Matadero. It was of good size with a paved road that continued to the highway, but we turned onto another dirt road shortly after leaving town. After several kilometers on the dirt road we popped out onto SIN-519 and took the small paved road the rest of the way into El Rosario, passing through several tiny towns along the way. It took awhile to find our way, but after asking around for directions, we finally made it to Neon’s cousin’s house. This is the same house Neon’s mother grew up in. My first iguana sighting. This fellow was hanging out between the roof tiles. Neon and his cousin. The photo behind them is his great grandmother’s great grandmother. Neon’s cousin is the town historian. He spent the day showing us old documents tracing their family lineage. The ceiling/roof of the room we slept in. It’s terra-cotta tiles on wood beams. The tiles are sealed with cement, and then covered with spanish tiles on the outside. It was truly a thing of beauty. This was carved in a stone doorway in the museum. They only recently discovered this room as it had been walled off long ago. The building used to be a prison several hundred years ago. This was a jail cell, so the thought is that the prisoners carved these drawings. An original door to one of the old jail cells in the museum. Before leaving the museum, a few friends of Neon’s cousin showed up. One of them is an anthropologist and has traveled all through Mexico and Central America. A road in El Rosario …looks like we found the right road (we’re heading to Zacatecas after Rosario).